What is Hardwax Oil Finish? Hardwax oil finishes are becoming a popular alternative to traditional aluminum oxide finishes due to their natural, unfinished look and feel that brings out, rather than covers up, the true beauty and texture of the wood. While still providing homeowners an effective and durable floor finish, hardwax oil finishes require a bit more TLC over the floor’s lifetime. Typically, traditional finishes are added to the top of the wood, in layers, building up a dense scratch and moisture barrier that seals off the wood’s surface. Hardwax Oil finishes, however, penetrate the wood’s pores, bonding with its fibers to strengthen and protect the wood from within. Once cured, the surface hardens creating a soft matte sheen that highlights and bring out the wood’s bold grain and natural beauty. Based on natural vegetable products with zero VOCs (Volatile Organic Compounds). Hardwax oil finishes have no effect on your indoor air quality. That means you get a non-toxic environmentally-friendly floor finish. For general cleaning, use Rubio® Monocoat Surface Care or Bona Professional Series – Natural Oil Floor Cleaner. Important: Do not use any other cleaners on the floor as most will harm hardwax oil finishes. Vacuum or sweep the floor on a regular or as-needed basis to remove dirt, sand, and grit. If using a vacuum, only use hard surface devices without beater bars. Fit furniture legs with felt tips or protective caps. Fix rolling furniture with soft rubber casters. Pick up heavy furniture or appliances when moving them; do not slide. Keep pets’ nails trimmed to avoid excess scratching. Limit direct sunlight on the floor by using curtains and blinds in areas that are exposed to high UV rays. Maintain relative humidity within a 20% range that is consistent with average indoor living conditions (such as 40%-60%). Use interior and exterior doormats at entrances to prevent dirt and moisture from being tracked onto the floor. Area rugs are also recommended in front of kitchen sinks and in high traffic areas. Watch the following videos to learn how to take care of and mantain your hardwax oil finished floor. To keep your hardwax oil finish floors looking great, we recommend keeping the surface free of dust and debris by regularly sweeping or using a vacuum designed for hard floors. 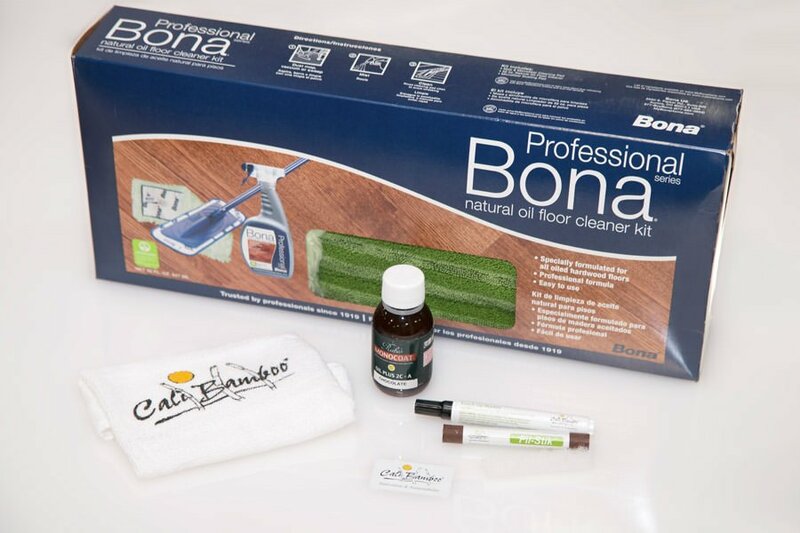 For soiled spots and high traffic areas, we recommend using Bona Professional Series – Natural Oil Floor Cleaner Kit, or damp mopping with a mixture of Rubio Monocoat Surface Care or Rubio’s Soap, diluted 100:1 with water. IMPORTANT – Do not use cleaners other than Rubio Monocoat, or Bona Professional Series – Natural Oil Floor Cleaner, as most of these will harm hardwax oil finishes. For small areas that need to be spot repaired use Super White Rubio Monocoat Oil Plus 2C-A Oil (100mL bottle). For Rustic Beachwood, use Super White Rubio Monocoat Oil Plus 2C-A Oil (100mL bottle). For Rustic Barnwood, use Charcoal Rubio Monocoat Oil Plus 2C-A Oil (100mL bottle). Clean the floor with Rubio Monocoat Surface Care or Bona Professional Series – Natural Oil Floor Cleaner and ensure the surface of the floor is completely dry before proceeding to the next step. Apply the oil with a clean cotton cloth or sponge to the worn area. Allow the oil to penetrate for 3-5 minutes, then wipe excess oil with a clean cloth until the surface practically feels dry. Do not let excess oil sit on the floor for more than 5 minutes as it may begin to thicken and become difficult to spread. Allow the oil to penetrate for 1 minute, then wipe excess oil with a clean cloth. Wait 4-6 hours after treating floors before you walk on them or return furniture. Every 1-3 years, we recommend using a color-matched Rubio Maintenance Oil to rejuvenate the color of your floor’s high traffic areas. Use Rubio® Monocoat Super White Maintenance Oil to bring the color back to Beachwood flooring. First clean the floor with the rustic flooring cleaning products(seen above). Next, simply apply your ultra white maintenance oil with a cloth, brush or sponge to worn areas only. Allow the oil to penetrate for 1 minute then wipe excess oil with a clean cloth. Be sure to wait 4-6 hours after treating floors before you walk on or return furniture to the floor. Because the surface of the wood is more openly exposed, hardwax oil finished floors tend to be a bit more susceptible to scratches. However, unlike traditional finishes, repairing a hardwax oil finished floor is quick and easy with Cali Bamboo’s touch-up markers and fil-stiks. For scratches, use the Cali Bamboo touchup pen on the scratch, and immediately wipe once with a clean cloth. For gouges, rub the Cali Bamboo fil-stik from the Basic Floor Care Kit into the gouge to fill the hole. Every 1-3 years, we recommend using Natural Monocoat Oil Plus 2C Finish to rejuvenate the color of your Beachwood or Barnwood floor’s high traffic areas. For Rustic Beachwood, use Super White Natural Monocoat Oil Plus 2C Finish. For Rustic Barnwood, use Charcoal Natural Monocoat Oil Plus 2c Finish. Pour half of the Oil Plus (A) into a large bucket and add the Accelerator (B) to the remaining half of the oil in the can. After closing the lid and shaking well, add the mixture to the bucket with the Oil Plus (A). Continue to stir until the Oil Plus (A) and Accelerator (B) are completely mixed. Apply the oil with a cotton cloth or sponge to the worn areas of the floor. Allow the oil to penetrate for 3-5 minutes then wipe excess oil with a clean cloth until the surface practically feels dry. Do not let excess oil sit on the floor for more than 5 minutes as it may begin to thicken and become difficult to spread. In a well ventilated room, the floor should be completely dry to the touch in 24-36 hours, at which point you can walk on the floor and move in furniture. Furniture should be picked up when being replaced; do not drag furniture across the floor. The floor will be fully cured after 7 days, at which point you may resume using Rubio Monocoat Surface Care, or Bona Professional Series – Natural Oil Floor Cleaner. Do not clean or wet the floor until it is fully cured.